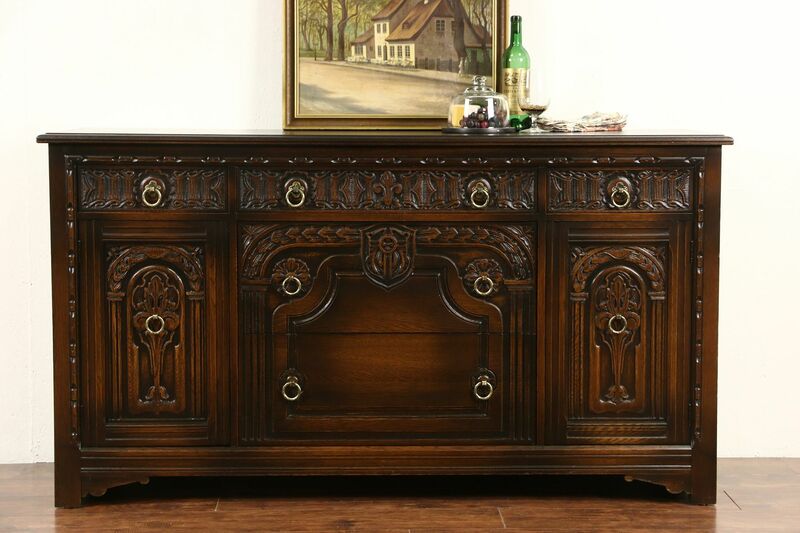 Richly carved of solid oak in the English Tudor manner, this sideboard, server or buffet could also function as a wide tv console. Most of it's "Life Time" of Michigan signature label is missing, as shown on the matching piece. The restored deep finish is in excellent condition, drawers have dovetailed joints. Hammered brass hardware is original on this American made antique furniture. Size is 66" wide, 22" deep and 36 1/2" tall. Matching pieces priced separately, contact us for availability and for shipping quotes.